May is national Pet Cancer Awareness Month and North Carolina State University’s College of Veterinary Medicine is a leader in battling pet cancers which, as noted by the American Kennel Club Canine Health Foundation, affects 50% of dogs aged 10 years or older. Cancer therapy is a rigorous undertaking, requiring multidisciplinary diagnostic and treatment capabilities. The NC State CVM, through the Oncology Service at the Randall B. Terry, Jr. Companion Animal Veterinary Medical Center, offers referring veterinarians and pet owners clinical expertise, advanced clinical trials for novel therapies, and state-of-the-art technology such as a new, state of the art linear accelerator. Certified by the American College of Veterinary Internal Medicine and American College of Veterinary Radiology as oncology specialists, clinicians in the Terry Center Oncology Service evaluate the pet’s condition, determine the most appropriate treatment, and coordinate any ongoing treatment with the referring veterinarian and pet owner. The Oncology Service sponsors the North Carolina Animal Cancer Program, a comprehensive treatment, medical education, and research center. The primary functions of the program are to provide comprehensive cancer treatment for pets; offer instruction in clinical and investigative oncology, in medical and radiation oncology, and in cancer biology; and to conduct leading-edge research. The Terry Center Oncology Service offers all types of cancer treatment–chemotherapy, radiation therapy, hyperthermia (tumor heating), surgery, and canine bone marrow transplants. Of note, the Terry Center is the only university clinic in the nation to offer canine bone marrow transplants. Clinicians also conduct clinical research and three current, ongoing studies include investigations into canine osteosarcoma, the most common bone cancer in dogs; soft tissue sarcomas, the most common type of solid tumors in dogs; and feline fibrosarcoma, injection-site tumors in cats. These and other funded clinical trials may offset treatment cost for study participants. Improved diagnosis and treatment of pet cancers can advance human cancer research and treatment. Oncology investigators in the NC State Center for Comparative Medicine and Translational Research, for example, focus on understanding the pathogenesis and treatment of cancer through studies involving, in part, spontaneous models of cancer provided by Terry Center oncology patients. In addition to working with Terry Center oncologists, CCMTR scientists collaborate with cancer researchers at Duke University Medical Center and the Lineberger Comprehensive Cancer Center at the University of North Carolina. These and other oncology academic, government, and private researchers value the opportunity to participate in studying cancers that occur naturally in dogs and cats. 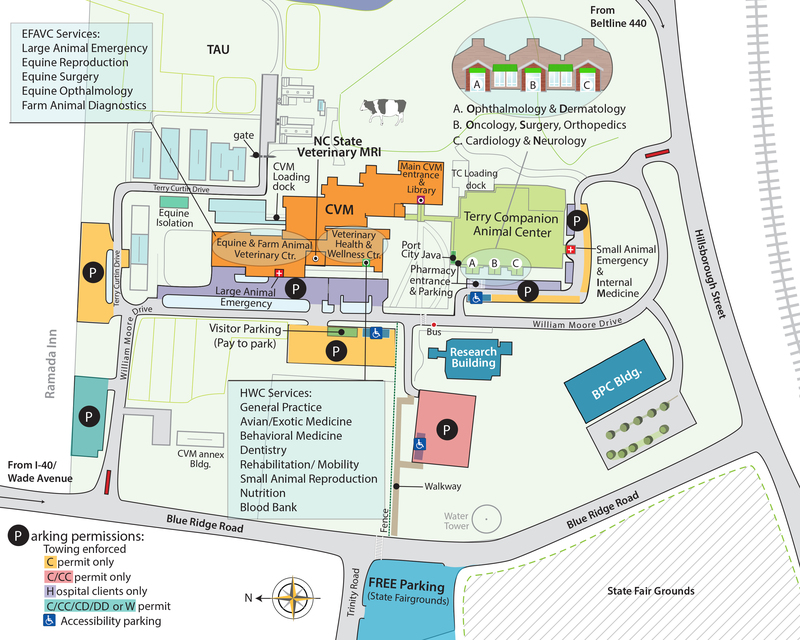 NC State’s CVM and oncology research.